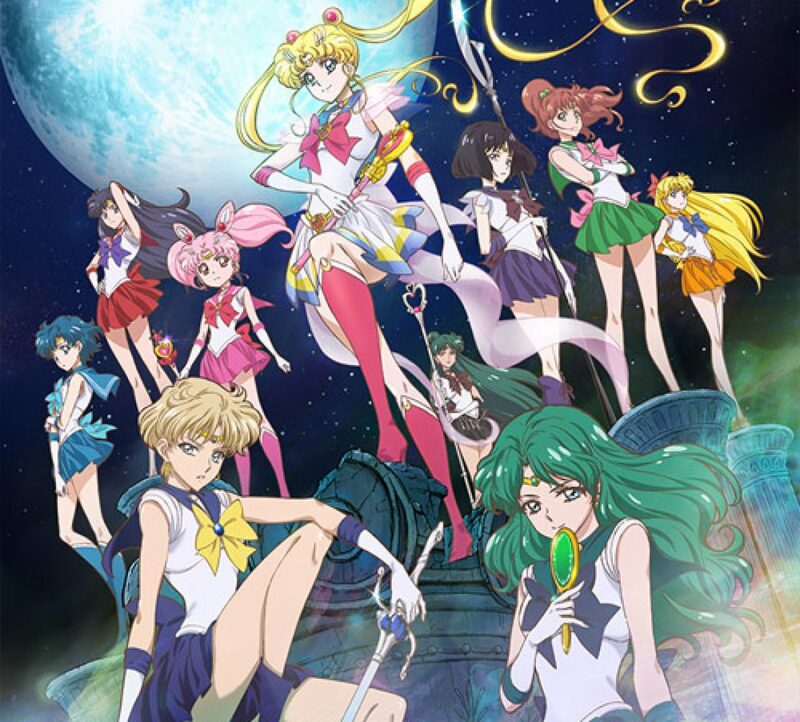 Sailor Moon Crystal Episode 5 Review | The Crystal Chronicles! Jupiter comes thundering in! Introducing the newest Sailor Senshi to the team, Sailor Jupiter! 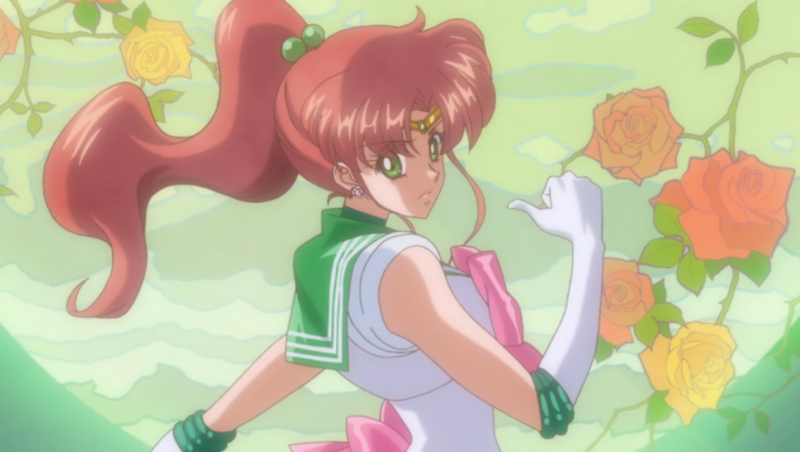 As the title “Makoto – Sailor Jupiter” suggests for Sailor Moon Crystal Episode 5. Usagi is surprised as she bumps into this mysterious girl a few times at school. Umino tells his fellow classmates that she has super strength and was kicked out of her old school because of fighting another student! Most students are scared of her due to the rumors about her, but Usagi doesn’t believe in them. How can a girl who saved her that morning, be so mean? Usagi stalks the new girl for her food. She joins the new girl, Makoto Kino, for lunch in the school yard. We learn that she lives alone, can cook and sew! They become friends and join Ami at the arcade. Rumors continue to spread about the Bridal Shop, so Usagi, Ami and Makoto go and investigate the location. Even though, Makoto isn’t a part of their team, yet, they end up getting distracted by the beautiful dresses not realizing the evil within… a ghost bride!! Apparently rumor has it one of the mannequins’ walks around at night seducing men and taking them away. They go visit Rei to get her opinion about the rumors, but she doesn’t believe in ghosts. She has a feeling that Makoto might be like them and that something will unite them soon. We finally see the ghost bride appear taking Motoki under her spell! He walks up to Makoto and convinces her that he loves her. She, of course, falls for “his trap” since he reminded her of her senpai who she had a crush on in her old school. 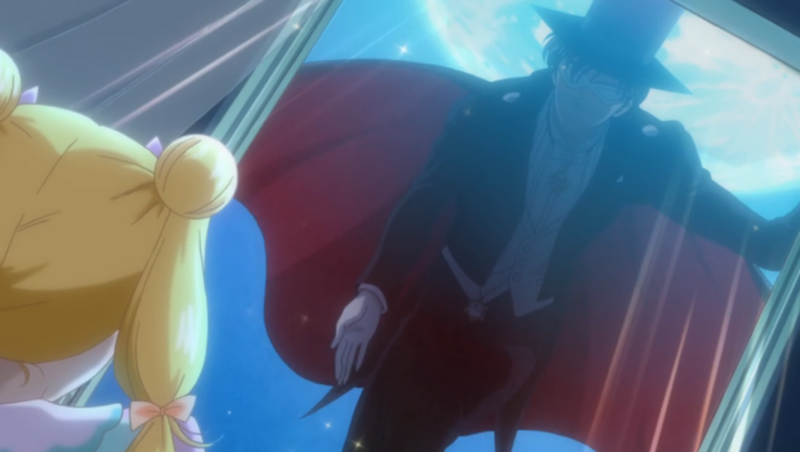 Tuxedo Mask figures out not only who Sailor Moon is, but where she lives too?! Well I guess it is not often you see a girl with that hairstyle with a black who is always with her. I have a feeling he knows who she is either by making a good guess or his senses (magic ability) leading him to her. He takes her to where Makoto is with a possessed Motoki to help save her before anything else happens to her. The girls transform to fight against the youma as the ghost bride. Nephrite appears showing he is in control and says “Pathetic humans. You’re so easily fooled by appearances.” That wakes Makoto up, which made her realize what Motoki said wasn’t true at all. Having her heart crushed by a possessed Motoki she started to be sad and depressed. Sailor Moon’s kind words help her get through it and Makoto gains the strength to fight back! Sailor Jupiter saves the day! Nephrite flees the scene. She tells the girls the truth of why she was fooled by the ghost bride, but also why she left her old school. She had a crush on a boy, who she was friends with, to only find out he had a girlfriend and she had no chance to be with him. It broke her heart to see him, but it wasn’t the only reason why she left her old school. She felt that there was something more than romance waiting for her at the new school. It was to be united with her fellow Sailor Senshi. 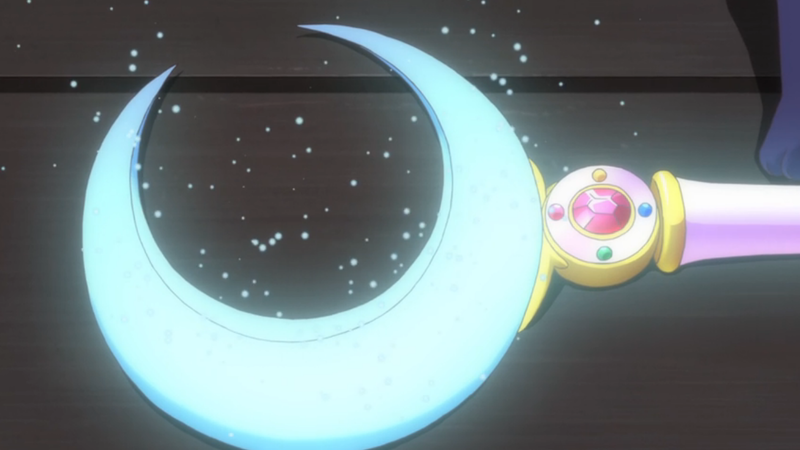 With the four Sailor Senshi united, Sailor Moon receives her Crescent Moon wand. Now to search for the Princess! This episode is the best one I have seen so far! Not only we are introduced a new character, Makoto Kino, but we get her backstory. We get to learn who she is, what she likes, what happened to her in the past and be able to relate to her! Even with this episode’s big focus on Makoto/Sailor Jupiter, we get to learn a bit more of the other girls. Rei doesn’t trust men, Usagi loves food, and Mamoru has a “sixth sense” & can see evil within someone, seeing the girl’s friendship growing and learn a valuable lesson! We all at one point felt like how Makoto felt during this whole ordeal. We all had crushes or loved others in our lives where they left us for one reason or another, but in order to move on we need to believe we can love again. This quote spoke to me, and I am sure many of you felt it too! Don’t give up on love! We will all find someone one day! The animation was great compared to the previous episodes. 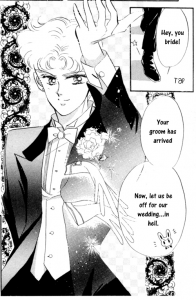 This episode was very close to the original manga storyline, expect Nephrite didn’t die and sadly we didn’t see Usagi disguise as a groom! It’s not a big disappointment, but overall the episode was very enjoyable! 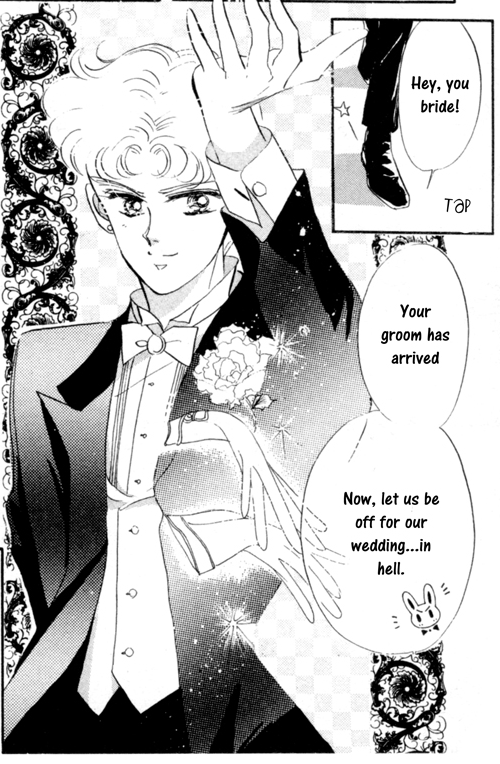 Usagi disguises herself as a groom. *Manga images from Miss Dream.